Remember those cookies I posted yesterday? They're already GONE. 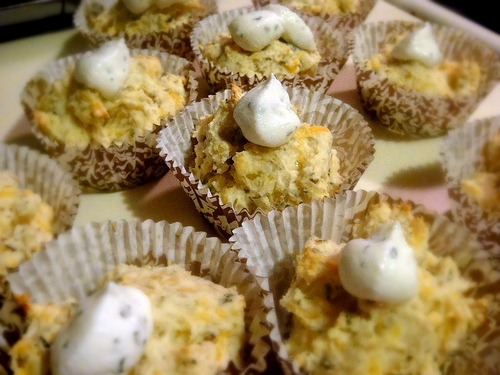 I wanted to switch gears and share a "savory" cupcake recipe. Everyone knows I love to make cupcakes and I have had several friends request I try a savory one. Finding a good recipe for this was harder than I thought. When I found this one on Eat Drink Pretty, the recipe seemed pretty easy to tackle and it was! Since I made these, I have come up with several savory cupcake recipes I hope to try soon. Be on the look out! Preheat oven to 350 degrees F. Line a mini muffin pan with liners. Mix the first seven ingredients (flour through salt) in a bowl. With a pastry blender (or using your hands), cut in 1/4 cup butter until mixture resembles coarse crumbs. Stir in the cheddar cheese. In a bowl combine 3/4 cup milk and 1 egg, slightly beaten. Add to crumb mixture all at once. Stir quickly with a fork to moisten. 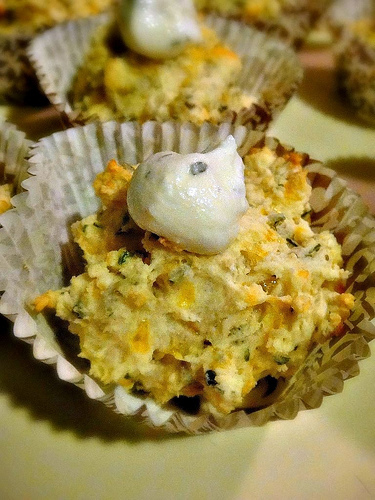 Drop a tablespoon of the dough into the prepared mini muffin pan. Let the goat cheese crumbles come to room temperature. In a bowl, mix the goat cheese, parsley and milk until smooth consistency, add more milk if too thick. Put the goat cheese in a ziplock bag and snip the corner with a scissors. Pipe the goat cheese onto the fully cooled cupcake and top with a slice of scallion.